Set against the background of New York's bustling streets, this is the story of a true urban dweller: a hefty and fluffy white chicken. Spanning a century in 50-year intervals, starting off in 1959, this is a documentation of diverse time periods as well as the human evolution, pivoting around the same street corner of a single city block. When a New Yorker walks past a chicken on his morning stroll, we are left to wonder which one is the real city slicker. People keep saying this short is nothing special, I beg to differ! The story asks a question that has never been asked before: What happens after the chicken crosses the road? It may not seem interesting at first, it turns out to be one hell of a fun, hilarious, ride. It's set in three time pieces all with different animation with the same event a man notices a chicken walk to his house and go inside it. One thing I love about this short is it's animation. Like I said before, it's three different types of animation and each one is very creative and fits the mood of the three settings perfectly. I can't say anything else about the animation because it would give away the ending, so, let's just say it's creative. Speaking of the ending, it's really funny!!! Again, SPOILERS!!!!! So I can't say why I like it! I don't know why I love this short so much other then the animation and ending. I just do!!! Just go search it up on Bing and watch it you will not regret it! For the last several years I have gone to see the Academy Award nominated shorts--both live action and animated. This year is a first for the animated category in that as we sat watching, I overheard a lot of murmurs about how bad the nominees were. The folks watching seemed, at times, genuinely mad at the choices. Fortunately, after three very sub-par films, the final three were excellent and it seems pretty clear that the race is between "La Luna" and "The Fantastic Flying Books of Mr. Morris Lessmore". And, like the last couple years, following these nominees, they showed some animated shorts that were not nominees but were sort of like runners up--and the folks I talked to preferred these films to several of the nominees. The film consists of three separate views of the same event--a chicken knocking at the door of a big city tenement and begin let inside. The first is set in the 1950s (and features an interesting minimalist style). The second in the modern day (and features a rather simple CGI look). The third is fifty years from now--in a dystopic zombie-like world (with some weird but creative CGI). 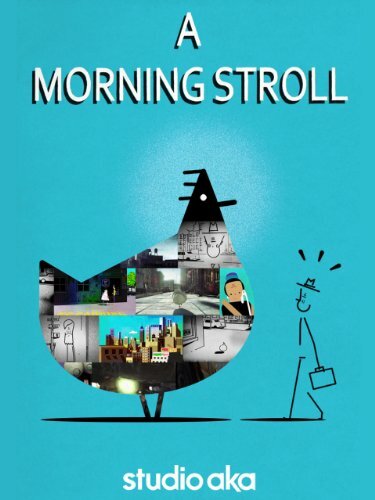 "A Morning Stroll" was another film that seemed to leave me and the audience flat. While portions of the film were nice (such as seeing the filmmaker take on three separate styles), the overall film looked like a student film showing off various styles that they have tried out--not a coherent short film. The biggest problem was the story. It never engaged. You know it's bad when the best thing about this one is the iPhone app--featuring a DDR-type game with zombies. Overall, I do wonder why this film was chosen as an Oscar nominee. I just didn't see what made this film outstanding.